A Russian Soyuz spacecraft carrying three new crewmembers is seen approaching the International Space Station on Sept. 25, 2013. The Soyuz ferried American astronaut Mike Hopkins and Russian cosmonauts Oleg Kotov and Sergey Ryazanskiy to the space station. A Soyuz spacecraft carrying an American astronaut and two Russian cosmonauts linked up with the International Space Station late Wednesday (Sept. 25), doubling the orbiting lab's crew size after an express trip to orbit. A Soyuz capsule carrying two Russian cosmonauts and a NASA astronaut arrived at the station at 10:45 p.m. EDT (0245 GMT Thursday), less than six hours after launching into space from Baikonur Cosmodrome in the Central Asian nation of Kazakhstan. 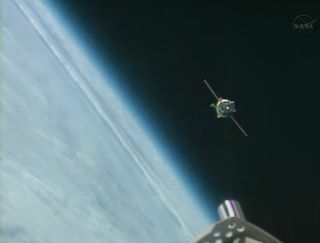 The two spacecraft were sailing 261 miles (420 kilometers) over the southern Pacific Ocean, just off the coast of Peru, during their rendezvous. You can watch the two crews meet live here SPACE.com, courtesy of NASA TV, beginning at 12 a.m. ET (0400 GMT). A Soyuz TMA-10M rocket launches from the Baikonur Cosmodrome in Kazakhstan at 2:58 a.m. local time on Thursday, Sept. 26, 2013 carrying Expedition 37 Soyuz Commander Oleg Kotov, NASA Flight Engineer Michael Hopkins and Russian Flight Engineer Sergey Ryazanskiy to the International Space Station. Tonight's docking marks the third visit to the International Space Station for Kotov, who served as commander of Expedition 23 in 2010. But Ryazanskiy is a spaceflight newbie, as is Hopkins, who is now the first member of NASA's 2009 astronaut class to reach orbit. "I'm certainly very honored and feel very lucky to be the first from my class to launch into space, but I think it's very exciting for my classmates as well because this is the start of our time," Hopkins told SPACE.com before launch. "I look forward to watching the rest of my classmates in the future launch to space as well." Kotov, Ryazanskiy and Hopkins will live aboard the orbiting lab until mid-March. Their three Expedition 37 crewmates — cosmonaut Fyodor Yurchikhin, NASA astronaut Karen Nyberg and Italian spaceflyer Luca Parmitano — have been in orbit since late May and are scheduled to return to Earth on Nov. 11. When that happens, Kotov will become commander of the station's new Expedition 38, taking the reins from Yurchikhin. American astronaut Mike Hopkins (center) and Russian cosmonauts Oleg Kotov (bottom) and Sergey Ryazanskiy wave just before boarding their Soyuz TMA-10M spacecraft during a launch to the International Space Station on Thursday, Sept. 26 from Baikonur Cosmodrome in Kazakhstan. Liftoff occurred at 2:58 a.m. local time, 4:58 p.m. EDT Sept. 25. Orbital Sciences holds a $1.9 billion NASA deal to make eight robotic supply runs to the space station using Cygnus and the company's Antares rocket. The duo launched together for the first time on Sept. 18, with the goal of showing that Orbital is ready to begin its contracted cargo missions. The original plan called for Cygnus to arrive at the station on Sept. 22, but a software glitch and tonight's Soyuz docking pushed things back a bit. NASA also signed a $1.6 billion dollar cargo deal with California-based SpaceX, which has already completed two of its expected 12 supply flights using the unmanned Dragon capsule and Falcon 9 rocket.